This is Forces of Valor 85329 1:72 scale Hurricane No855. 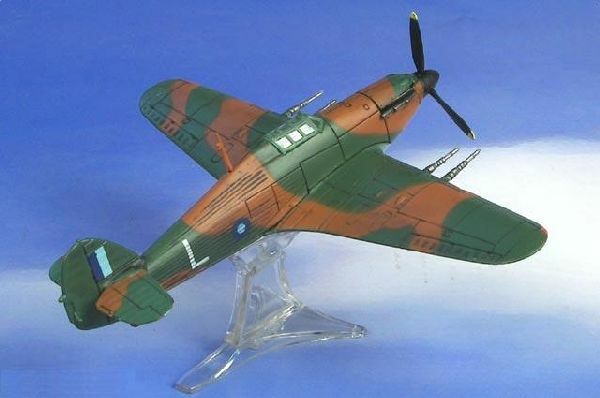 This is Forces of Valor 85329 1:72 scale Hurricane No855. The Unimax Forces of Valor Hurricane No. 855 is a diecast plane from the Unimax Forces Of Valor 1/72 aircraft range that accurately recreates the aircraft flown by airforces around the world, past and present.The powerful Hawker Hurricane was not as celebrated as the Supermarine Spitfire but unbeknown to most, it had more enemy kills than all others in the U.K. arsenal! As the most numerous of fighter aircraft and aircraft squadrons, the Hurricane shouldered most of the attacks by the German Luftwaffe during the Battle of Britain. The Hurricane forced the Luftwaffe to commit its BF109's and BF110's to protect its long range bombers. All Unimax Forces Of Valor models are painted and finished to the highest quality.